Vikatan Made A Design Like Vijay Holding A Politician In His Shoulders !! Reactions Are Just Hilarious !! Movie Sarkar, a political thriller starring actor Vijay, swept the box office and minted over Rs.100 crores within two days of its opening. But the movie has run into trouble over some scenes that allegedly attacked late Chief Minister J Jayalalithaa’s welfare schemes. “They are showing freebies given by the elected government being burnt. This amounts to indirectly inciting people, and comes under sedition,” said Mr Shanmugam, comparing the screening of Sarkar to a “terrorist activity”. It is also reported that Police officers went to A.R Murugadoss’s house to arrest him and the director moved to madras high court to apply anticipatory bail. 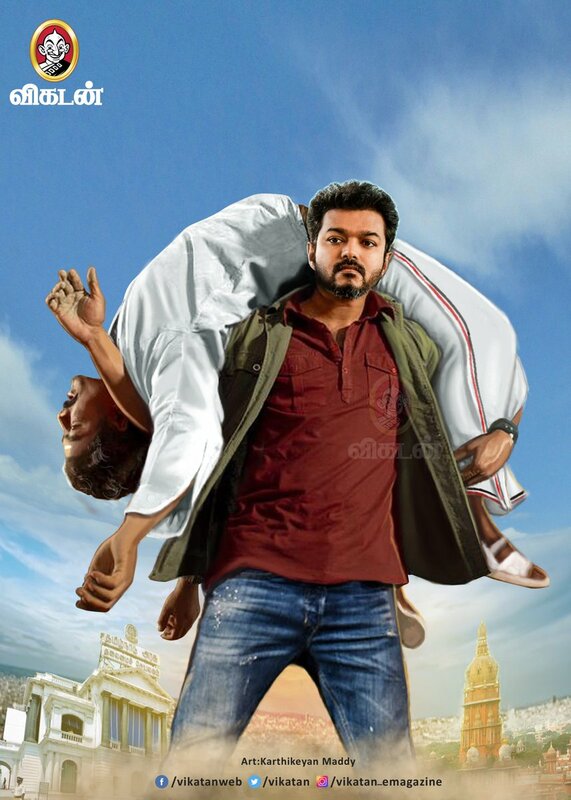 Now Vikatan magazine in their official twitter account posted a design in which they morphed one of the fight move in the film “Sarkar”. They placed a politician on Vijay’s shoulder where the actor holds a fighter in the movie. For this design they received hilarious reactions from their followers. The design suggests Chennai city in the background. It shows Tamilnadu government head office and Central building in their both the sides. கோர்த்து விட்டு வேடிக்கை பார்க்கனும், அதானே உங்க ஆசை? உத்து பார்த்தா ஓபிஸ் மாதிரி தெரியுது..என்ன எ.பா க்கு வேல பாக்குறியா ? What do you think on this design ?? Comment below !! Previous articleAfter Police Banging Murugadoss House At Midnight !! Here’s What The Director Is Upto !! Next articleC.S Amudhan Condemns ADMK !! Hilarious Reaction From Him For “SARKAR” Issue ! !